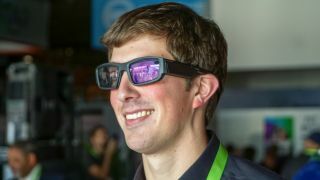 Vuzix, the company that wowed CES last year with its Vuzix Blade augmented reality (AR) glasses, is finally selling a finished product just in time for CES 2019. As promised, the Vuzix Blade pair of AR glasses are available directly from Vuzix for $999.99/€1,099 (about £793, AU$1,431). This is a mighty steep price for AR glasses with Amazon Alexa inside. The cost includes immediate access to the Vuzix Blade Developer Center, which offers product documentation, support forums, sample code examples and downloads. With included software features like this, it’s clear that this first public run of Vuzix Blade is intended for developers and enterprise end users – not regular consumers. For a start, these glasses aren’t exactly fashionable, and we found that they weren't terribly comfortable during our hands-on test of them at CES 2018. However, there are prescription lens options for people who wear glasses already. Also, the centered orientation of the AR content displayed on the lenses suggests support for more focused use cases (i.e. work) than simply walking around town. Still, if you’re super bullish on augmented reality and want to jump on on the next phase right now, here’s your chance. Expect to see your pair of Vuzix Blade glasses within four to six weeks of ordering. However, no matter how innovative these AR glasses may be, at that price point it might not make the kind of impact Vuzix is hoping for.